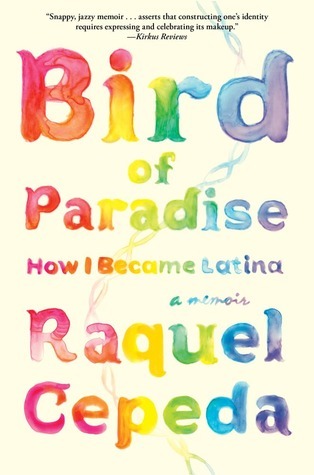 Globetrotting journalist Raquel Cepeda takes readers around the world from New York to the Dominican Republic to Morocco and back again in Bird of Paradise: How I Became Latina. If ever there was a book that meets the guidelines for the Books: Passports to the World challenge, this is it. There's a lot of information to digest within the pages, but it's well worth the read. Born the daughter of an idealistic mother and an unaffectionate father, the young Raquel spends much of her time trying to figure out where she fits. That applies to both her home life, which is turbulent, and, later, her school life. Upon being sent to the Dominican Republic to be raised by her grandparents following her parent's divorce, her childhood happiness peaks. Her mother brings her back to the States, a puzzling decision since she seems to have no use for her, where she witnesses domestic violence on a daily basis. Eventually, Raquel is sent to her father and stepmother in New York, and they seem to have little use for her either. Verbally abused by her father, and occasionally a victim of domestic violence, Raquel merely bides her time until she can leave for college. While most teens seek solace in her friends and classmates, the author finds little comfort there either. In America, there is a tendency to categorize people. We want people to fit into a "checkable" box. As a daughter of the diaspora, Raquel felt a kindred connection to other people of color, but for her black classmates, she was too white and for her white classmates, she was too black. So there was a separation by skin tone and even more, a separation between those Dominican students who had been in America for a while and those who had recently emigrated. I believe that everything happens for a reason and after reading this book, I think Cepeda does too. Her childhood and young adult experiences eventually lead her on a journey to find out more about her family's ancestry. While she could go the genealogical route, she's more interested in finding out where her people originated. Yes, they ended up in the Dominican Republic, but how did they get there? What is their ethnic origin? What is the history of relations between Africa and the island? And why does she feel so drawn to una india, an Amerindian or Indigenous-American spiritual guide? Occasionally I have a-ha moments with books, I had quite a few with Bird of Paradise. The one that stands out most is the whitening of the country. While Hitler was killing Jews in Europe, Rafael Trujillo was doing the same to Haitians, sanctioning the killing of 20,000 Haitians in what became known as the Parsley Massacre. To further whiten his nation, he encouraged Europeans, those fleeing Hitler especially, to emigrate to the Dominican Republic. Trujillo's suppression of all things African was continued by his successors up until 1996. Another a-ha moment came as I read about the fluidity of race in the Dominican Republic. The U.S. has long practiced the one drop rule, in which one drop of African/African-American blood means you're black. In the DR, it is the opposite. One sixteenth of white blood means you're white. Darker Dominicans who have attained a higher financial or social status can be deemed white as well. Fascinating stuff indeed. So I know I've rambled on much longer in this review than usual, but it's the perfect blend of storytelling and science. It's a fascinating read for all of my genealogical/anthropological readers, as well as my memoir readers. It should be noted that there are phrases sprinkled throughout in Spanish, but that shouldn't dissuade you from reading it. Some of them are translated, others are not. If you have a basic knowledge of any of the romance languages, you should be able to infer what is being said.